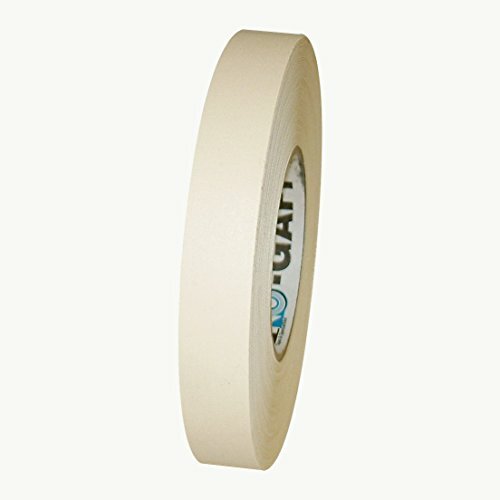 Pro Tapes Pro-Gaff Gaffers Tape is a high strength vinyl coated cloth tape with a matte finish. It has a high performance adhesive system and is highly conformable to irregular surfaces. Pro-Gaff has a waterproof backing, is abrasion resistant, and has a smooth, controlled unwind, and is hand-tearable. Engineered for demanding applications such as wire and carpet hold down, vinyl school bus seat repair, gaffing lights, spiking, color coding, climbing wall route setting, marking boxes, stage and set decoration, splicing floors and bundling wires. Pro-Gaff Gaffers Tape is water and temperature resistant, removes cleanly from most surfaces, and resists tears and punctures. 1 inch Pro-Gaff is also used as a route setting tape on rock climbing walls. It comes in the widest array of colors of any of the gaffers tapes we sell including colors can?t get in any other gaffers such as electric blue, purple, tan and teal. This is a very dependable product used throughout the entertainment industry. NOTES: Sizes shipped will typically be the tape industry standard metric-cut sizes, i.e. 24mm for each 1 inch of nominal tape width ordered (rolls are approximately 5% narrower than the nominal size). This product's actual size is 24mm x 50m. In the photo the colors are the following (starting from the leftmost column and working down): Olive Drab, teal, Grey, Purple, Brown, Electric Blue, Burgundy, Green, Yellow, Red, Black, White, Tan and Dark Blue.Technical InformationCore: 3 inch diameterBacking/Carrier: vinyl coated clothAdhesive: synthetic rubberThickness: 11 mils (carrier, adhesive)Adhesion: 80 ounces per inch (to stainless steel test panel) Tensile Strength: 50 pounds per inch (longitudinal) Service/Operating Temperature: 50F to 200FElongation: 5 %.